Very nice, good idea. In ss and dlc with black dial only imo. Looks fantastic Eddie. Any chance of a ceramic bezel? I agree that a ceramic bezel, matte or dull rather than shiny would be great as it would be a massive improvement when compared to the CWC bezels which seem to be made from playdough. However If we are talking pie in the sky improvements, how about a ceramic lumed bezel? I realise this would push the price way up though. I like the fact the hands are closer in shape to the MOD style hands, it’s the thing that has stopped me buying the original PRS3. I think the installation of a thicker minute hand would be good change, closer in shape to the first versions of the CWC? Last edited by Sinnlover; 28th November 2018 at 10:33. PVD is a definite winner. That shade of blue is also very nice indeed, especially on the PVD case. Although I fully understand the coloured versions are bound to be attractive to a more niche audience. A lumed bezel of any description would be a real plus, even if it is lume-filled engraving on an insert (but I agree a sapphire/ceramic one would be nice). Is this an optical illusion, but the crown guards seem to protrude from the case a little more than I am used to seeing? In order to keep dial symmetry, I would personally prefer to see a date only at 6, but I fully appreciate that the originals are as shown (D-D at 3) so am also perfectly fine with that. Given that I've a WTB for a PRS3-LE then yes, - blue or yellow please, drilled lugs 41mm max, plenty of lume, oh and an orange edged minute hand, in fact 'snowflake hands' the way Tudor did them. The coloured (non black) dials would benefit from black edges to the hands for increased readability. I like the PRS-3 LE hands better than the PRS4 Broadarrow hands - it was much easier to read the time with black edge highlights. Yes!!!!!! I'm assuming they'd be as good and a damn sight better value than the CWC versions. With regard to returns, will the PRS-53 ever make a welcomed comeback? I only sold my LE because it was just too chunky for me, but I do want to add a yellow dial diver to the collection. Good work! Yes would love one, would love one even more if there was a no date option. For me it would just be the standard black with silver or pvd. And a thumbs up for 39mm as mentioned above. Salivating at the prospect of next year becoming another great Timefactors incoming year. Brilliant!!!!! As above, plus fixed bars. Well I have one, still love the original. Don't like day windows. Maybe a date with a cyclops? Maybe a date with a cyclops? fixed bars, nice nato strap and a dial without numerals....? 39mm and 120 click bezel - hell yes! Yes. Day and date at 3 and drilled lugs please. Last edited by wildheart; 29th November 2018 at 09:58. You're going to kill my budget over here, sir. And I JUST bought a used CWC Quartz MK II!!!! So, yeah, I'm in for a blue dial. Or maybe the black, since my CWC has no date. Fixed bars or spring bars? And if the latter....bracelet? Bracelet? Hmmmm? And I concur with the previous poster who pointed out the orange and yellow dials would benefit from (thin) black edged hands and black surrounds on the hour markers. 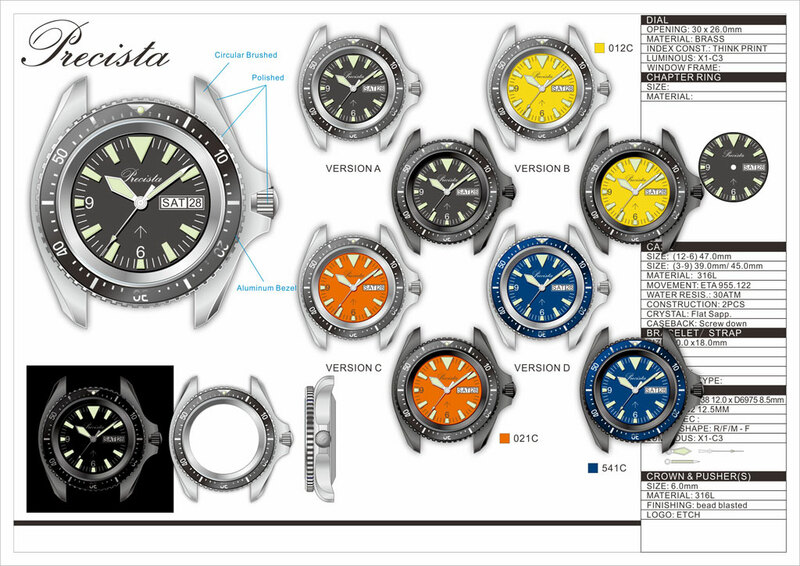 How about a lime green dial a la that Stowa diver, I forget the name. The overall aesthetic doesn't work for me, but I think that lime (or melon?) green dial color is splendid. EDIT: Ah hah! No fixed bars in the render; so springbars. As Narc'd pointed out below, the crown guards do look a bit too pudgy. Drilled lugs would be a big plus, too. A no-date version would be nice; great clean dial like my PRS-18q. But I'd buy the day/date version in a heartbeat. I think the traditional aluminum bezel insert is the way to go. Or steel. Ceramic would make it too...current, I guess. Its a ten from Len. I think these watches would be popular so please make them. I'm a fan of the design and so are a lot of people, the extortionate prices CWC charge put people off them however. A more affordable price point would definitely be in demand in my opinion. My preference is for silver, black dial and a no date option - if a watch is available with a no date option then I'll always opt for that. I like a nice uncluttered dial in a dive watch. If there has to be a date can the day option be dropped? Also I hate that vacant space at night time where the date has robbed the dial of a lume mark at the 3 o'clock position. If there has to be a date can it still have a lume mark like this Broadarrow please? Another point is that the minute hand on the watches in the renderings looks a little anemic in comparison to the hour hand. This frustrated me with the CWC watch, anyone with a keen eye will have noticed that I swapped it in the first photo above - replaced with a Zeno minute hand in this instance. This makes the hands look far better balanced IMHO. More wish list stuff - can the chapter ring be brushed instead of polished? It's less distracting and this is noticeable with a Broadarrow PRS-3 and a CWC side by side. I don't mind if the bezel insert is aluminium but I also hate scratched bezels so if spare inserts were available it would be really nice. (Or entire spare bezels as is the case with CWC). I haven't managed to scratch my CWC Mk.2 yet (and it gets used) but the insert is recessed a hair below the top of the bezel and this has saved it a couple of times as evidenced by slight marks to the steel rim of the bezel itself. I agree with previous posters that said if the bezel insert should be ceramic then could it have a matt, non shiny finish. I also agree that with an orange dial then black bordered hands improve legibility over white ones. And hopefully those crown guards won’t be as beefy as the render makes them appear?" ...but in a no date version. Yes, would love to see a return. Prefer date only. Day/date on dials seems to detract from otherwise more clean aesthetics. fixed bars ,day date, stainless steel and brushed finish ...and a pvd. A bit of a tweak. Does the crown need to protrude so much, if it didn't the crown guards could be smaller giving a more balanced appearance. Thats a great look Eddie and does send the watch in another direction! Slightly irrelevant post, as although I'm after a new watch to take diving, I'm wanting mechanical not quartz. Last edited by Cornholio; 29th November 2018 at 15:45. Liking it a lot with that bezel Eddie. Agree with number 2’s comments above regarding the crown and guards. Can't do drilled lugs on this because of the curve on the lugs, it would look weird to have a hole there. I like the daydate feature, I miss it from my CWC SBS when I wear a watch without the day feature. Any ideas on a price yet? I'd love the black version, spring bars, 39mm to be made I have a Broadarrow PSR3 in silver nice to get a black one. Still good for me as long as that lume triangle is nothing like the one on the COSC which refuses to glow much at all. I’m also good whichever way we go on the day-date / no date etc. I did mention it in my first post but thought it was a bit cheeky as it was on the original version so edited it. Looks like a lumed ceramic bezel as well. That really makes it stand out when compared to the competition. As some have said already, I think a clean face with no day date is preferable or just the date. Regarding the crown guard i would prefer to see one less pronounced and more akin to the CWC diver, to give a slightly more balanced appearance. Love my PRS-3. The one thing I loved the most was how comfortable the case was to wear. I hope that doesn't change, though a smaller version would be ace! Same here, the PRS4 was the slimmest water resistant watch I had which could fit comfortably under my motorbike jackets & waterproofs, and not get a massive cold draft up the sleeve. If the case size and dimensions are exactly the same as the Zeno made PRS3 & PRS4, I may need to reconsider the purchase of an orange dial PVD version. I still have the black Parnis bracelet, although a Nato strap over fixed springbars would be OK as well. P.S. - the black edges to the hands look much better. Yes please Eddie, day and date. I prefer the broad arrow over the 'L' symbol. Perhaps a Magnum PI style special edition? I applaud the intent to revive this and to provide a better value alternative to the over-priced CWC offerings, but I would urge restraint on 'enhancements'. In particular, I would strongly advocate not replacing the aluminium insert with shiny ceramic on the grounds that shiny ceramic looks cheap and nasty. For me it conjures up images of ceramic Rolex sub knock-offs or Seiko mods fitted with ceramic inserts lifted from ceramic Rolex knock-offs. Why not use a really high quality aluminium insert with a more scratch resistant surface? The treatment of the bezel pip on these can also make the difference between classy and crappy. i.e. a recessed pip fronted by a flush perspex window. One final point: if you have to include calendar functions, then how about date-only? I always think the day/date windows on these watches exerts far too conspicuous a presence on the dial. I'd take the original specs over the tweaks. Why not use a really high quality aluminium insert with a more scratch resistant surface?